It’s time to get nerdy. Very nerdy. While I’m going to post some auction values end the article’s end (I just lost 99% of the readers), the focus of the words is to concentrate on setting a pitcher-hitter split by just using Standings Gain Points (SGP). It’s not going to work with every league type. Not even close but it’s a theoretical solution which can help an owner the best chance to get the most value out of every draft pick or auction dollar. It’s definitely a better option when trying to set in-season values. The following process is definitely ripe for discussion and argument. While writing The Process, Tanner and I debated this idea and even brought in others to determine if the pitcher-hitter split can be done by using SGP values. We published without including the concept as we were still ironing it out. We are still not in 100% agreement but here is the idea. To start with, here are the averaged standings from all the NFBC Main Event leagues last season. From this information, a certain stat baseline must be reached to at least be competitive in any category. Owners need to set a stat baseline well above the 15th place team and most times, I aim to first at least get near the 6th place range while creating my team. The reason to not aim for the low values is these stats may be from inactive teams and it takes a more than usual to move up one spot. Note: I mainly concentrating on the NFBC where there is no trading. If a league has trading, an owner could aim for players who push above the top limits and then trade them later in the year. For example, look at the Runs category. In the middle spots, it took about 12 Runs to move up one spot in the standings. So for the SGP formula, 12 runs above average are needed for 1 SGP. But to move up from 15th to 14th, it would have taken 40. The difference at the top is almost the same (39). 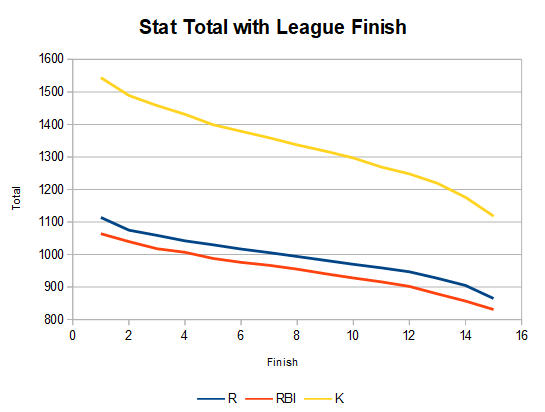 To visually represent these increasing differences, here’s a visual of the Runs, RBI, and Strikeout totals needed. It can be seen that the stats needed to move up one spot stays relatively constant except at the head and tail. An owner should not be concentrating their resources on a stat that extends a lead or they can’t compete in. They are wasted resources. At times, owners may just be forced to keep adding to a total. One year in Tout Wars, I had a significant lead in strikeouts and I was just wasting each additional one. The deal was that I needed my best pitchers to keep throwing to get Wins and lower my ratios. All of that mumbo jumbo was to show that once a baseline of stats is reached, any way to pick up a point in the Standings should be valued equally between pitching or hitting. One SGP in Runs equals one is ERA equals one is Steals. Looking at the split another way, I took the SGP values and ranked them 1 to 345 (23*15) and matched them up to the NFBC draft-and-hold ADP (average draft position). I didn’t need to add or remove any pitchers or hitters as the totals for each worked out perfectly. I gave each pick a SGP value based on its ranking. For example, the top-rated player, Bartolo Colon, got the highest value and so on down the list. I totalled up the values and found that pitchers got 37.4% of the auction values and hitters 62.6% of the values. I find it interesting that in these leagues, where owners put hundreds, if not thousands of real dollars on the line, they are spending quite a bit of their budgeted resources on pitching. Part of the boost may be from closers since owners feel they need a closer or two and they will pay a premium for them (more on closers later once more bullpen situations have stabilized). The big take away is from the preceding: Pitchers, especially the effective workhorses, should and are likely to go as premium picks. But owners may be taking the transition too far by overvaluing closers or the third tier of starters. Second to fourth round hitters may be now a good investment. It’s just the beginning of the offseason and these player values will move around, but it seems like by using SGP to set the hitter-split, a good estimate of how the league will values player is a decent starting point. Bonus fodder. Here are my current rankings from four separate sources with some personal adjustments starting to trickle for some players. They are far from done as I slog my way through who looks out of place and verify a projection I’m comfortable with. Also, I don’t have any projections for any Japanese signings so they will be added at some point. The calculated auction values will seem low to actual values. Inflation always happens. I’ve included the averages values from last year’s NFBC auctions as a reference but will discuss them at later date. For now, feel free to provide your unwanted opinions on how these rankings are complete garbage. We hoped you liked reading Setting the Hitter-Pitcher Split to Create Overall Rankings by Jeff Zimmerman! You had me at “it’s time to get nerdy”.